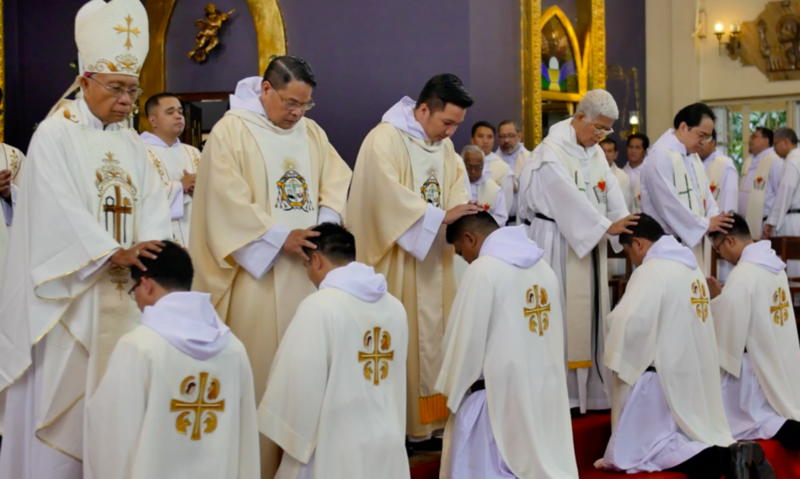 Mira-Nila Homes, QUEZON CITY—Five friars of the Province of St. Ezekiel Moreno were ordained to the Sacred Order of Presbyterate through the imposition of hands of Most Rev. Antonio R. Tobias, DD, Local Ordinary of the Diocese of Novaliches, during the 430th anniversary of the birth of the Augustinian Recollection at Our Lady of Consolation Parish, December 5, 2018. In the homily of Bishop Tobias, he articulated: “Today the Church is gifted with the gift of priesthood being answered by our five ordinandi. We thank their families…their formators for the support that they have extended to these our brothers.” He also thanked the Order of Augustinian Recollects for forming them as “authentic, genuine Augustinian Recollects.” The ordaining prelate explained that “they are being ordained today so that they may serve the people of God wherever they are sent. Give your best wherever you are sent. Where you are sent is where God wants you to be,” he added. 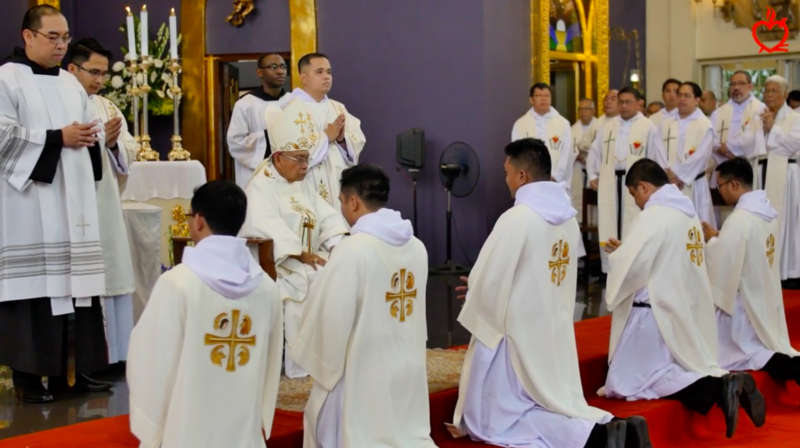 The Ordaining Prelate was joined by exactly fifty religious priests and diocesan priests from Bicol, Cebu, Negros, Surigao, Baguio, Cavite, Antipolo, Manila and Quezon City and three from abroad (Cuba, Rome, and West Africa). The parents of the candidates, who are all present, received a plaque of appreciation for generously offering their sons for the service of the Mother Church. They are as follows: Mr. Eulalio and Mrs. Teresa Demillones, parents of Fr. Paul Demilliones; Mr. Ronald and Mrs. Lucelda Jarumay, parents of Fr. Niel Ryan Jarumay; Mr. Crescensio, Jr. and Mrs. Teresita Pahamutang, parents of Fr. Keneth Pahamutang; Mr. Elpedio, Sr. and Mrs. Peregrina Sarita, parents of Fr. Elpedio Sarita, Jr.; and Mr. Samuel and Mrs. Estrella Caligdong, parents of Fr. Kenneth Caligdong. Another awaited moment during presbyteral ordinations was the announcement of new assignments. The patente of each newly ordained was announced by Fray Jose Ernil Almayo, OAR, ProvincialSecretary. Fr. Paul is assigned at Parish of Our Lady of the Abandoned, Valencia, Negros Oriental; Fr. Niel Ryan is appointed to be with the brothers in San Isidro Labrador Parish, Casian, Taytay, Palawan; Fr. Keneth is assigned to be a formator at Sto. Tomas Villanueva Formation Center, San Carlos City, Negros; Fr. Elpedio and Fr. Kenneth are back to Our Lady of Sierra Leone Parish, Kamabai, WestAfrica and St. Paul Parish, Kamalo, West Africa, respectively, where they had their diaconal exposure program. Also present during the Presbyteral Ordination were the Recollect Augustinian Youth, Confraternity of Augustinian Recollect Altar Servers, Former Seminarians of the Order of Augustinian Recollects (ForSOAR), seminarians from other religious congregations, CaReS Family Apostolate, families, relatives and benefactors of the ordinandi. On this occasion of the birth of the Augustinian Recollection, the OAR Religious, and AR Sisters headed by Mo. Lucena Antipala, AR, renewed their vows. The Secular Augustinian Recollects also renewed their promises. 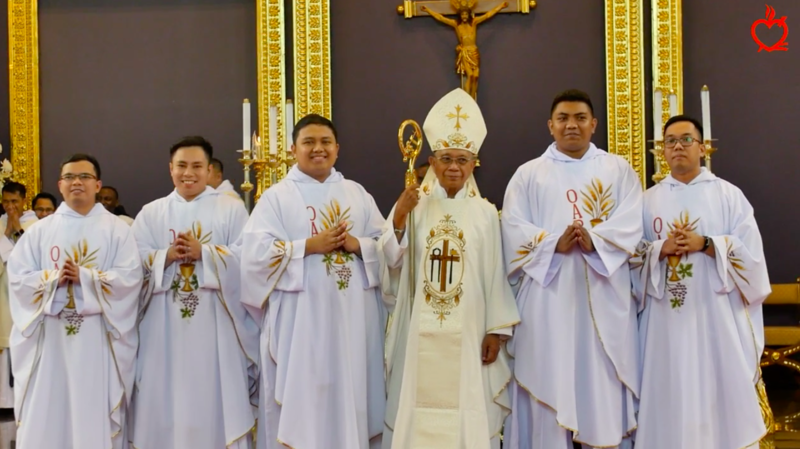 Fray Dionisio Selma, OAR, Prior Provincial, received the renewal of vows and promises of the members of the Order in the Philippines.